Despite leading the nation in economic growth since 2001, the vast majority of workers in Silicon Valley have been excluded from the area’s enormous economic boom, according to the results of a new study that reveals that nearly nine in ten jobs pay less today than they did 20 years ago. 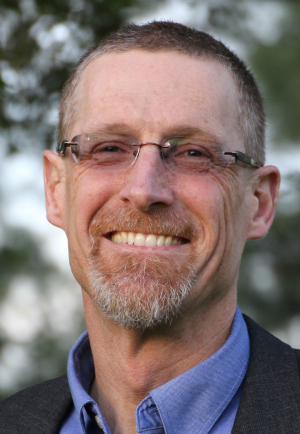 The study was led by Chris Benner, professor of sociology and environmental studies at UC Santa Cruz, where he is the director of the Everett Program and the Santa Cruz Institute for Social Transformation. A report brief, "Innovating Inequality? How Tech's Business Models Concentrate Wealth While Shortchanging Workers," is available online; the full report, "Still Walking the Lifelong Tightrope: Technology, Insecurity and the Future of Work," is also online. The tech sector has developed and propagated business models that give outsized rewards to a few top investors and executives, at the price of increasing financial insecurity for everyone else who contributes to the industry’s success, said Benner. "Tech investors and executives are receiving disproportionately large earnings, as they capture unfair returns in winner-take-all markets and from monopoly technology rents, to the detriment of Silicon Valley’s workers and residents," said Benner. "This isn’t about technology increasing inequality, it’s about the rules and rewards that determine who benefits from innovation." 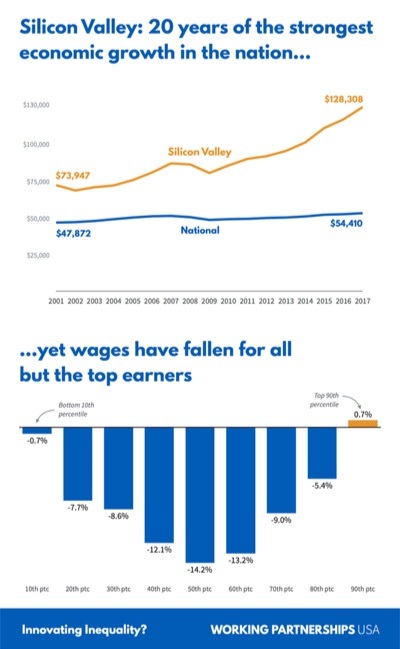 Over the past two decades, per capita economic output in Silicon Valley increased 74 percent, yet inflation-adjusted wages fell for nearly 90 percent of jobs. The proportion of middle- and high-paid jobs in the area has decreased during the past 20 years, while the proportion of low-paid jobs grew. Workers’ declining share of Silicon Valley’s GDP has cost the average Silicon Valley worker $8,480 in annual earnings. Working Partnerships USA collaborated in the research for the report. "Cities across the country are falling head over heels to emulate Silicon Valley’s boom, but the reality is that tech's business models mean 9 in 10 workers here don’t share in the benefits—only the costs in sky-high housing prices and gridlocked traffic," said Derecka Mehrens, executive director of Working Partnerships USA. "It’s clear those business models need to change so that the workers and communities who make the tech industry’s success possible see a fair return on their work." Ensuring workers have a voice on the job and the freedom to stand together and negotiate a fair return on their work. Setting responsible contracting standards to ensure tech’s subcontracted service and supply chain workers are paid livable wages and have critical benefits like affordable healthcare and paid leave. Working with surrounding communities to address the consequences of tech growth -- especially sky-high housing costs and the resulting displacement -- and pay their fair share to fund essential public services.